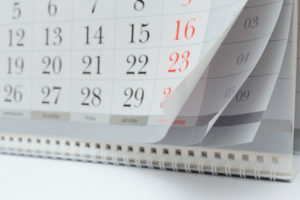 Editorial calendars are the cornerstone of blogs and of all content marketing. This planning tool has been around for years. The traditional calendar is a schedule to keep track of articles from concept and development to publishing. An editorial calendar can increase traffic to your blog by helping you plan, organize and produce valuable content on a regular basis. But how do you develop an effective editorial calendar? The best approach is to keep it simple. Here is a sample calendar, followed by a few comments. Let’s take a look at each element of the calendar. It’s good to set target dates for completion, as well as track the actual publication date (or dates) for different platforms. By indicating the categories in the editorial calendar, you’ll get a clear idea of whether you are covering one subject area too much (or too little). Identifying keywords can help you stay focused and may help with SEO. Webinars, reports and the like can provide valuable material for blog posts. It’s good to track how many of your material comes from such content. You want to include enough to be of value and show that you’re up-to-date with developments in your industry. At the same time, you don’t want to curate all your material because that reduces your opportunities to showcase your expertise. Curating content about 25 percent of the time is a good rule of thumb. Another approach is what Brian Dean calls the Skyscraper Technique, where you take something good and you make it better. This has the advantage that you don’t have to start from scratch. Instead you’re enhancing or updating existing content to make it even more valuable. Note that, since I work with B2B clients, this calendar is rather sparse. A B2C company would probably have many more entries as it might have tie-ins to more holidays, events and anniversaries. Finally, it’s good to keep lists of topic ideas and source material, including your existing content. By periodically reviewing your previous posts, you may find topics that can be updated with new content. This approach may save you the time of drafting a new post from scratch, while still providing valuable material. These comments apply to blogs with single authors. If you are managing a blog for a company or organization, it’s good to identify the writer of each post in your calendar, as well as the visuals. Also, if you’re managing a blog for an enterprise organization, consider using a dedicated editorial calendar platform such as Kapost or Trello. Otherwise, keep the platform simple. An Excel spreadsheet, a Word document or a Google Doc work fine for most small organizations. Finally, the Content Marketing Institute has lots of great information on editorial calendars, including articles on Editorial Calendar Tips, Tools and Templates and How to Put Together an Editorial Calendar for Content Marketing. Kay is proactive, accountable and gets results.